Today I have the IT Cosmetics Fall 2017 Collection which includes a whole bunch of great stuff, so are you ready? IT Cosmetics Fall 2017 Collection includes the following items (some new, some slightly older): Confidence In A Cleanser (which I forgot to photograph), Confidence In An Eye Cream, Bye Bye Under Eye Concealing Pot, Bye Bye Line Foundation, Bye Bye Redness Skin Relief Treatment Moisturizer, Bye Bye Redness Erasing Correcting Powder, By Bye Redness Correcting Cream, Bye Bye Breakout Full-Coverage Treatment Concealer, Bye Bye Breakout Powder, Bye Bye Pores Illumination, Bye Bye Pores Blush, Your Skin But Better CC+ Airbrush Perfecting Powder Illumination with SPF 50, Brow Power Powder, Heavenly Luxe Brow Power Universal Brow Transformer Brush #21, Superhero Liner 24 HR Waterproof Easy Glide Liquid Super Liner and Perfect Lighting Radiant Touch Magic Wand. I didn’t swatch or try every single thing pictured here because some didn’t really apply to me (redness and break-out items) but most of it is below! 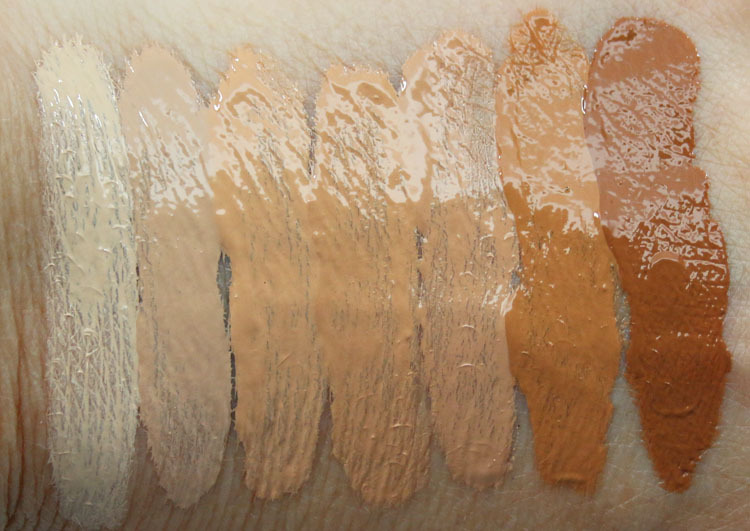 Bye Bye Lines Foundation comes in 7 shades and it has an anti-aging, skin-smoothing, hydrating coverage. Look what’s inside it! Anti-aging peptides, caviar extract, hydrolyzed collagen, hyaluronic acid, argan oil and babassu oil, plus vitamins A, C, E, B1, B2, B3, B5, B7, B9 and CoQ10—and features proprietary Drops of Light Optical Blurring Technology™ for an airbrushed, lit-from-within glow. 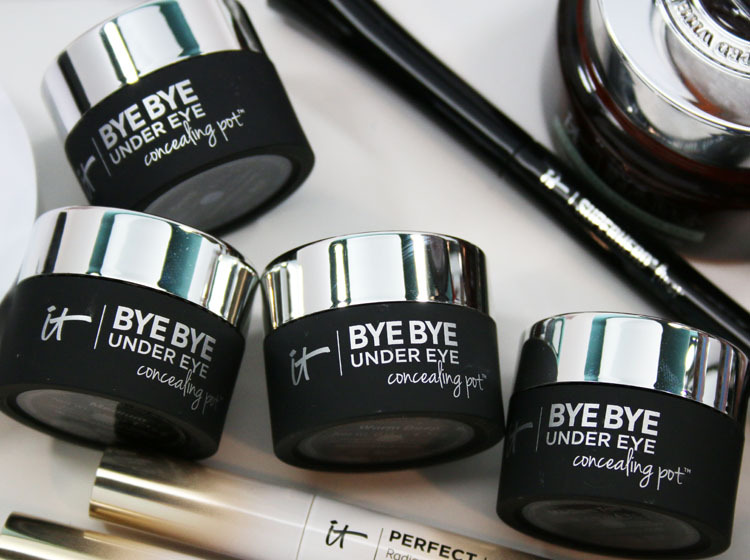 Bye Bye Under Eye Concealer comes in 6 shades and it offers a skin-smoothing and line-minimizing coverage which won’t settle into fine lines or crack. It also has anti-aging ingredients including hydrolyzed collagen, peptides, hyaluronic acid, antioxidants, caffeine and green coffee extract. Your Skin But Better CC+ Airbrush Perfecting Powder Illumination with SPF 50+ comes in 7 shades. 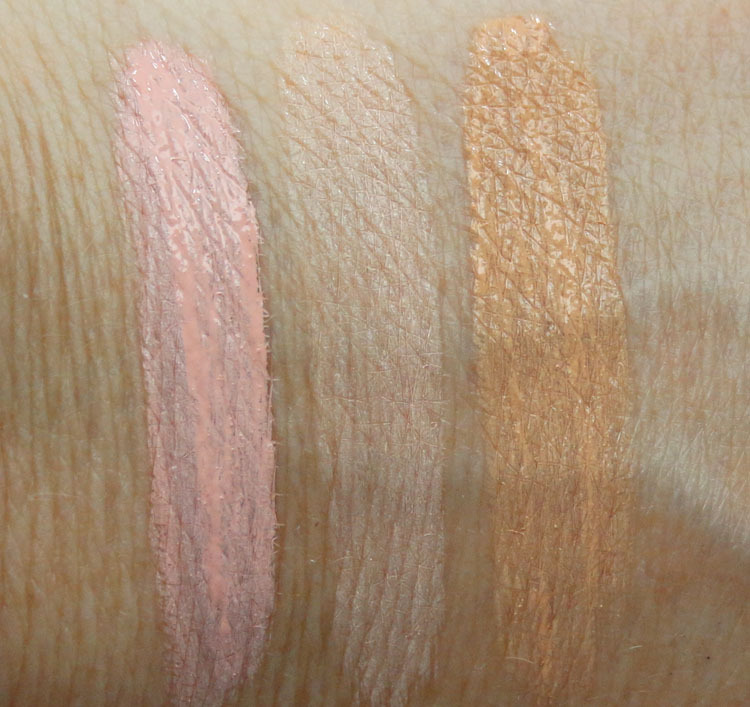 It’s infused with micronized pigments of light for a lit-from-within finish without glitter or shimmer! In addition to delivering subtle radiance, this game-changing powder combines buildable optical-blurring coverage, proprietary Drops of Light Technology™ and SPF 50+ physical sunscreen to camouflage the look of imperfections and deliver powerful sun protection. Plus, it’s completely talc-free, so it won’t settle into lines or pores and doesn’t crease, cake or crack. CC+ Airbrush Perfecting Powder Illumination™ also contains anti-aging hydrolyzed silk, hydrolyzed collagen, niacin and peptides. 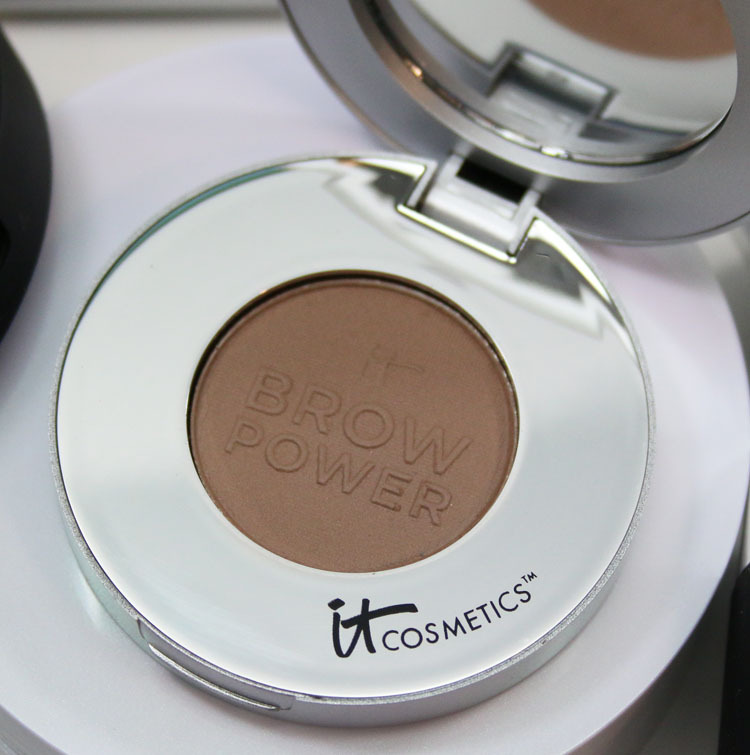 Brow Power Powder in Universal Taupe claims to be waterproof and is infused with brow-enhancing biotin, saw palmetto and argan and jojoba oils, plus anti-aging antioxidants and collagen. Bye Bye Pores Blush comes in 3 shades (this is Sweet Cheeks -a new shade) and it has optical blurring pigments, a buildable formula and antioxidants and peptides. Bye Bye Redness Correcting Concealer, Moisturizer and Powder are all aimed at cutting down redness in your skin and specified for those with sensitive skin as well. 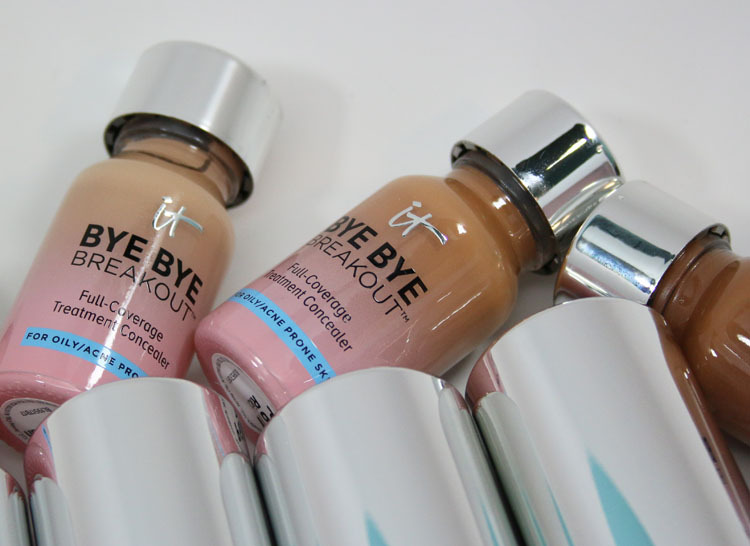 Bye Bye Breakout Full-Coverage Treatment Concealer comes in 7 shades and is for oily and/or acne prone skin. 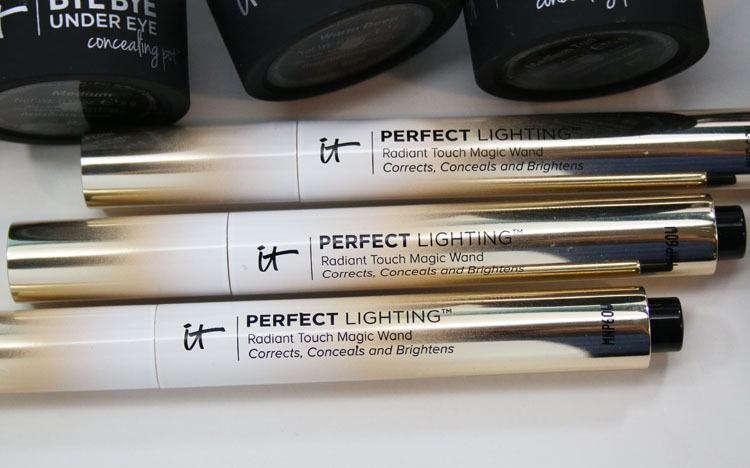 Perfect Lighting Radiant Magic Touch Wand comes in 3 shades. It has a click-up pen-style and corrects, conceals and brightens skin. 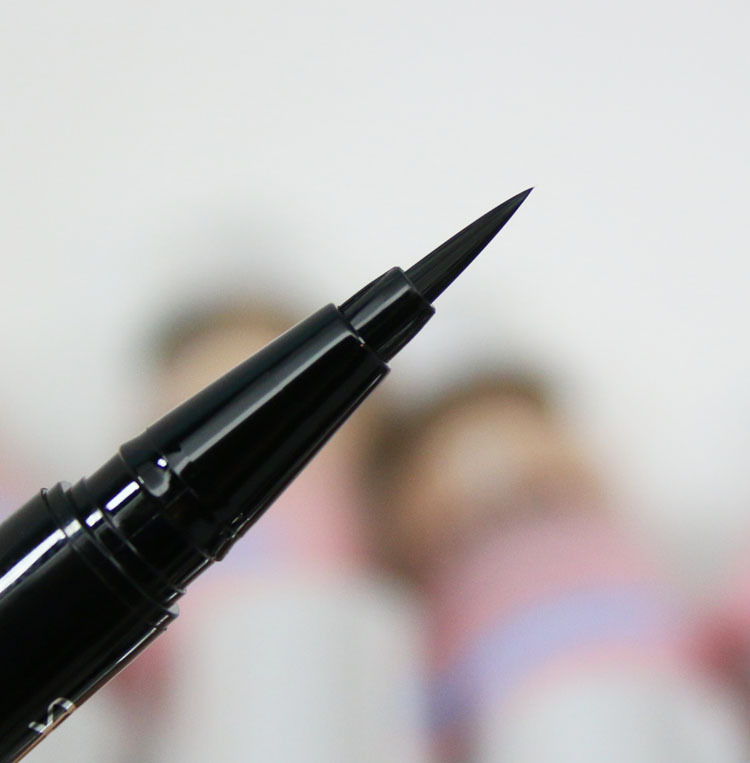 Superhero Liner 24HR Waterproof Easy Glide Liquid-Gel Super Liner comes in one shade called Super Black. It claims to have a 24 hour waterproof formula and a smooth, non-skip brush. Ok let’s discuss everything swatched above. I have to say I absolutely LOVE the Bye Bye Lines Foundation and my shade is Light. It’s been awhile since I wore an actual foundation as I usually just do a BB Cream type product, so I wasn’t expecting to like it much. But I was wrong. Obviously it’s thicker than my usual BB Cream, but that wasn’t a bad thing. I really loved how it made my skin look kind of radiant-ish and all my “imperfections” were hidden, but I didn’t look like I was wearing a ton of product. It definitely made my skin look more refined than it does with just a BB Cream. It doesn’t take much to cover and you can build it up. 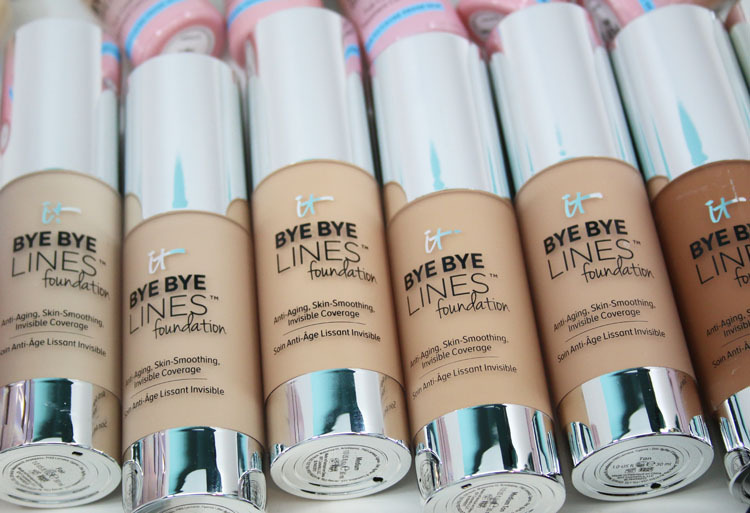 Now the Bye Bye Lines Concealer is another thing I actually really like, which I tell ya, is a MIRACLE because concealer never works much for me. This didn’t crease, settle crack or do anything else horrible all day long. Even when I set it with a light powder on top it didn’t crease at all. It helped somewhat with my dark under eye circles (NOTHING but surgery will rid them entirely) so I was ok with that. The Perfect Lighting Magic Wand pens honestly didn’t do much for me. I prefer something a little more shimmery and in a powder form. And it took forever to click the pens to get them started. Sweet Cheeks Blush is frickin gorgeous! It’s a beautiful shimmery coral/gold shade and I highly recommend it. Universal Taupe Brow Powder is a great, cool-toned, extremely pigmented taupe shade, This stuff is SUPER pigmented so I have to tap it off and wipe it off before I apply it on my brows or it looks way too intense. Superhero Liner in Super Black is a nice jet black liner. The brush style worked really nicely and smoothly as promised. I don’t know if it’s technically “waterproof” but it did last 11 hours on me without cracking or smearing off and it did seem a little harder to remove than a normal liquid liner. A couple things not pictured here that I wanted to mention were the new Confidence In A Cleanser Skin-Transforming Hydrating Cleansing Serum ($28.00) and Bye Bye Pores Illumination Poreless Finish Airbrush Pressed Powder ($29.00). The cleanser seemed like it was going to be great, but it actually made my skin feel a little bit tight and dried out. Boo. The Poreless Finish Airbrush Powder is great! It has a slight translucent glow (not shimmery or glittery though) which gives you a radiant finish and it works really nicely over the foundation. You can find everything from the IT Cosmetics Fall 2017 Collection on their site now! Is there anything in this collection that you are wanting to try out? Thank you! This was SUPER helpful, Kelly. I have wondered so much about their concealer, but refused to buy it until I heard a good review from someone I trusted- because of my shameful “drawerful of dud concealers”. But you have a lot of the same criteria for concealers that I do, so I really, really trust your take on it. I also love IT Cosmetics Bye Bye Pores finishing powder and their brow pencil, so that was points for them, too. Heading over to Ulta today! Yay! The shade Fair works for me with a bit of white mixed in. I did like the finish too! That blush looks amazing! I need to pick it up. Yay I am glad you found one that works for you! 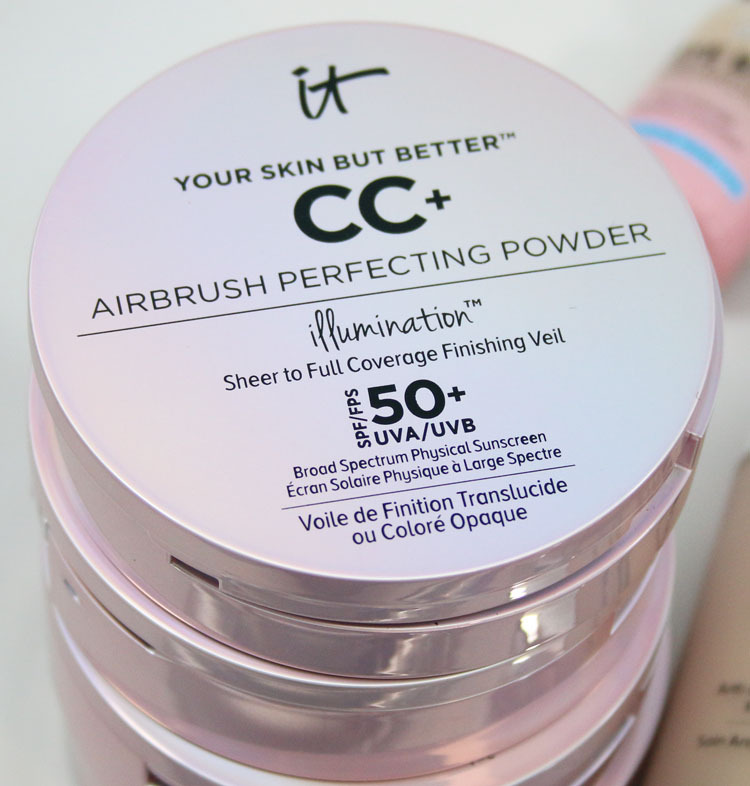 How did you like the CC Airbrush Perfecting Powder (the one pictured in your photo with SPF 50)? I didn’t see you mention it in your summary. Did you wear-test it and is it super heavy or more in between? I didn’t try that one yet! I’m glad to hear about the formulas working for you, even though we’re not the same shade we have similar issues with texture and pores! I might have to try them. I really want to try the CC powders. I tend to shy away from powders because I feel like they make my skin look older, but I do plan on trying this one out. I’m glad to read your opinions on these products, Kelly, thank you. I also really like the concealer and, surprisingly, the cleanser – for me it works as well as a double cleanse without worrying about getting oil in my hair. The Bye bye Redness Correcting cream has had HG status for a long time, that stuff is seriously magical if you have scarring, broken capillaries, rosacea etc. Now I want to try the illuminating finishing powder. I really like most It products I’ve tried. 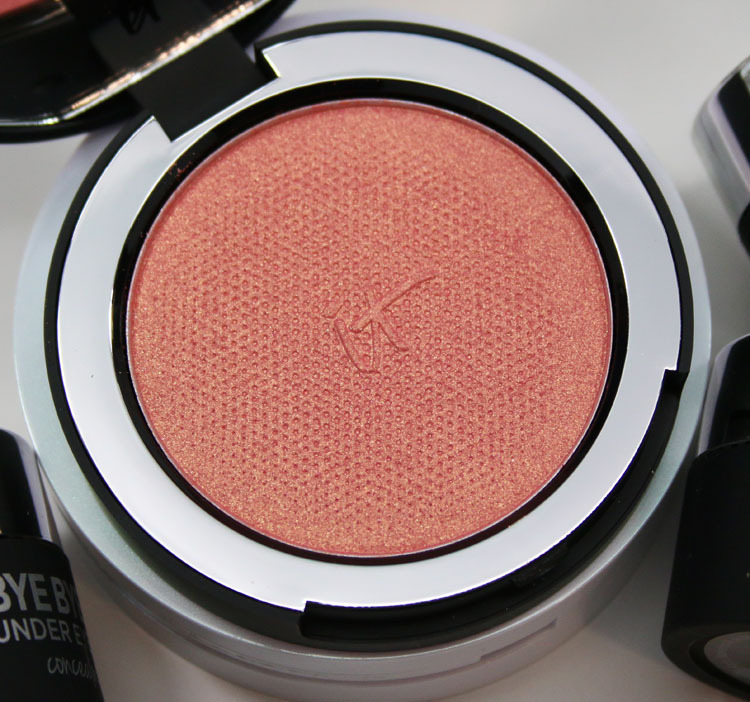 Omg, that blush is gorgeous!! I’m sorry to be negative here, but it really bothers me that the company sent you the SPF powder, blemish concealer etc in every shade and you didn’t take the time to at least swatch them with the others just because they don’t apply to you. 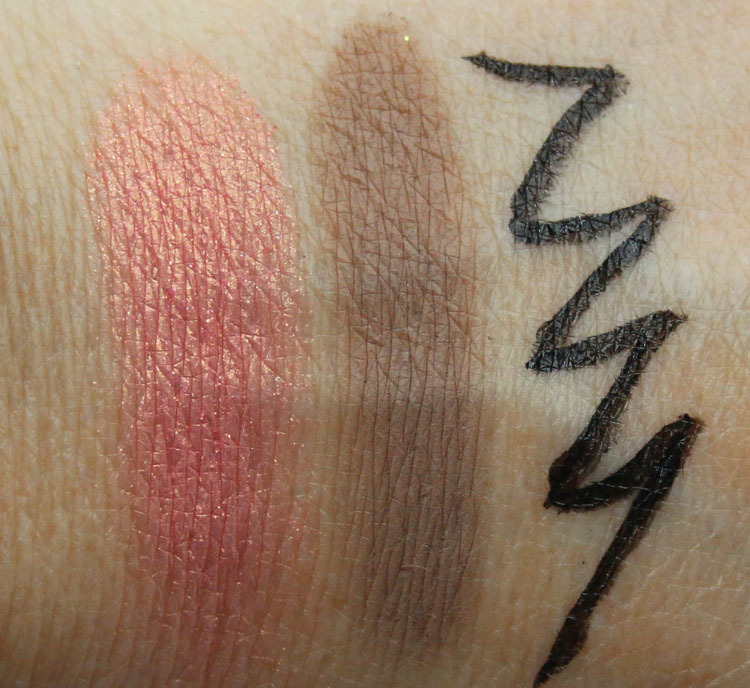 I respect your stance of not *reviewing* them since they aren’t applicable to your needs, but the swatches would be helpful to your readers who are interested in the products, and you already have them all right there. I’m really interested in the powder and would like to see what the shades look like! I would have liked to see those products swatched as well, for those of us who do have issues with redness and my teens that could use a quality blemish concealer. 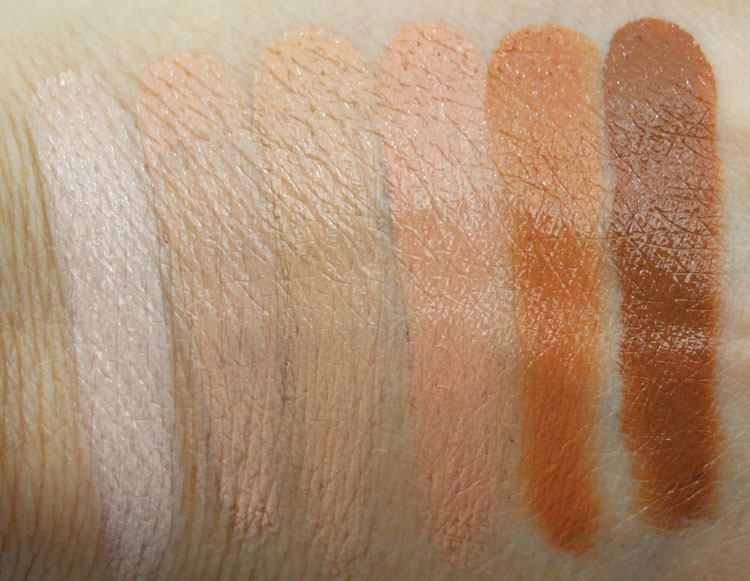 Sort of disappointed that the Medium Tan shade is pretty light. I’ll see if I can purchase that and Rich and mix them together. Thanks Kelly. I was looking for a review and swatches on the BB Lines foundation, so thanks! My store is not likely to get it, so I’ll have to online shop and I really like to see it. 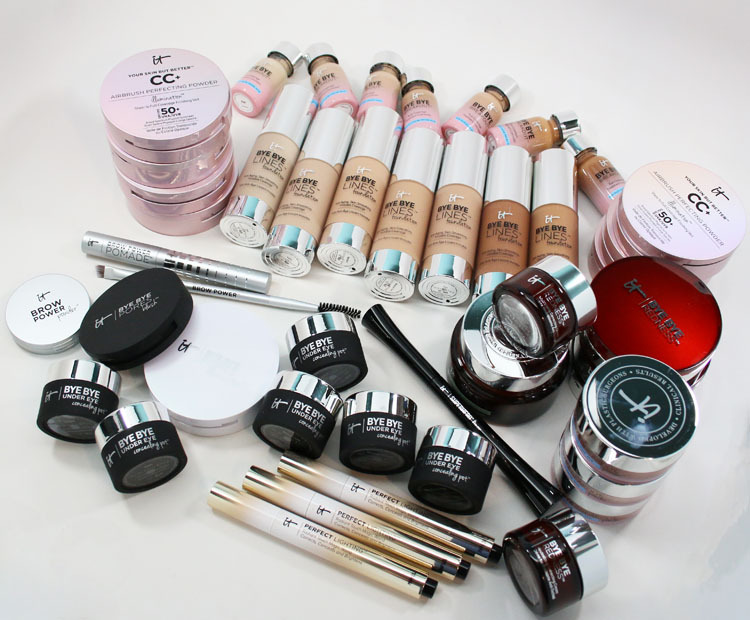 I generally love It Cosmetics. 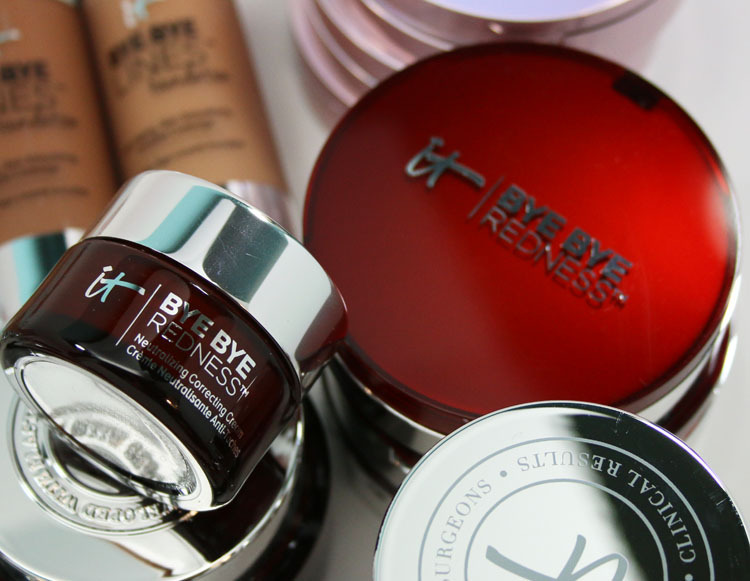 I am using their original Bye Bye Redness and CC cream daily. That blush looks so beautiful, which is why I went right to IT and bought it. That will teach me to toss away package before trying something. I was excited to try it, and was left with a glittery mess. This blush contains so much glitter, I immediately gave it to my 18y/o daughter. After which I had to remove what was on my face and begin again.